All huntsman spiders belong to the Sparassidae family and called as such because of their speed and their mode of hunting. If the jumping spider has a spy-like disposition for hunting and the Brazilian wandering spider is the most venomous, the huntsman spider is known for its size. 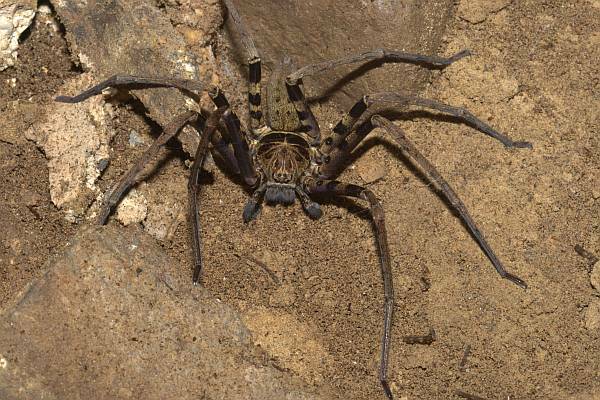 The male species seen in Laos has a leg span of up to 30 cm, and if you measure its whole body, it will roughly be the same as the size of a human hand! All huntsman spiders belong to the Sparassidae family and called as such because of their speed and their mode of hunting. They are not web-weavers and they are known to wait for their prey to come closer before they strike, similar how the lion king hunts for their food. They have several known aliases, which best describe some of their characteristics. In Africa, they are called as “rain spiders” because they immediately seek shelter before rain falls, I guess they hate to take a bath. They mostly seek shelter on woody places such as forest, mine shafts, wooden shack and woodpiles, so the name “wood spiders” stick. They live mostly in Australia, but because they “travel”, they can also be found in the Philippines, Japan, India and some parts of the United States like Hawaii and Puerto Rico. They are also known as “giant crab” spiders because of their huge appearance and their crablike legs that allow them to move freely, either forward, sideways or in any direction for that matter. Even though they are huge, their long twisted legs (their trademark) enable them to travel rapidly through long distances, and allow them to wander on walls and ceilings. Huntsman spiders have smooth furry bodies, brown or gray in color, large fangs and eight beady little black eyes. Their vision is not as outstanding as that of a jumping spider, but enough to detect dangers from some distance, so some are known to run over and bite you if you touch the walls that they are clinging onto. Yes, they are defensive. They are initially known to be shy and harmless creatures except when you are a member of the insect and invertebrate species they eat. Basically, they are afraid of humans, and will immediately scurry away from you unless they are with their young. The female species are known to be much aggressive than males. It is because they sometimes carry their egg sacs in their jaws. They will arch up their bodies giving you some warning that they are ready for a fight, and when they attack, they use their impossibly long legs to cling onto you, making it hard to shake them off. They can give you a bite or two before you will be able to get away from them. The huntsman spider’s venom can immobilize its prey and this helps to digest its food. Swelling, nausea, headache, vomiting and heart palpitation are some of the effects of its bite on humans. You can place cold packs to ease the swelling and pain but if some symptoms don’t disappear, call the doctor immediately. It is also beneficial to identify the kind of spider that bit you, to give you the right cure. I’m from Puerto Rico, and one of these was in my bedroom, close to the window. I wanted to eliminate it because it had eggs, and I didn’t want many of those close to the house. So, the spider was poisoned, thus killed, good news. Bad news, the babies scattered, and I’ve been seeing those creatures for a month at least.